Desert Pea Media (DPM) is a non-for-profit charity that has been active in remote communities for the past fifteen years. Through collaborative storytelling, song-writing workshops, short films and documentaries, DPM’s vision is to live in a country that respects, embraces and supports First Nations people to live a life of their own design. As a side note, for those who didn’t already know, a Desert Pea (otherwise known as a Sturt Pea) is one of Australia’s best-known wildflowers and is native to the arid regions of central and northwest Australia. This story starts in September 2016, when the Desert Pea Media team of four, comprising of Toby Finlayson (the Creative Director), Jared Melrose, Ashleigh Butler and myself, headed off in convoy on a mission. The first stop was Bellbrook, NSW, where we spent the weekend at a Vanlife gathering there. Vanlife is the brainchild of Jared Melrose and his long-time friend, Johnny Dustow, a concept that has now blossomed into a nationwide movement. Vanlife honours the importance of community and its intention is to bring people together to share knowledge, skills and art in an organic, all-inclusive way. Through social media, Vanlife creates a platform where hundreds of unique stories and photos can be shared from people all over the world, living on the road. You can check out the Vanlife website: www.vanlife.com.au and on Instagram @vanlifediaries. The next Vanlife Gathering will be held in Cudgen, NSW from the 26th - 28th May 2017. Get your tickets online. Open to anyone who wanted to get together, camp for the weekend and contribute to a celebration of country, storytelling, music and food. This unique Vanlife gathering started with a welcome to country from the Thungutti elders, organised through YARN Australia and Sixty Thousand and the people of Bellbrook. The Thungutti people took time out to come to the site where the gathering was being held, and as we sat around a big campfire, they told us dreamtime stories and sang traditional songs. Everyone was captivated. Warren Roberts, a Thungutti man, from YARN Australia, held space for people to ask questions about Aboriginal culture and the issues that Aboriginal people face today. It was a space where people could feel comfortable asking questions about anything, even about sensitive subjects that don’t get addressed often. It was a nourishing experience where I was able to connect with a group of people, mostly of which had never met each other before. The diversity of knowledge that everyone brought to the mix was a joy to witness. I can relate closely to the lifestyle choice of living on the road. It taps into the untameable traveller in me. After saying our goodbyes we got back on the road and embarked on a 13 hour drive due west to Wilcannia. It wasn’t until we had spent a week in Wilcannia, that I really knew the meaning of what Toby said that day. Wilcannia is a small town located within the Central Darling Shire in North Western New South Wales. What was once one of the largest inland ports in New South Wales now sits on the banks of a dry Darling River. While there is not a lot in the way of agricultural activity in Wilcannia anymore, the river has always been central to life in the remote town, as a source of food as well as social and cultural activities. Most of the population of around 600 are Paakintji, meaning “people of the river”. Farmers along the Lower Darling blame greedy and influential cotton growers around St George, Moree, Goondiwindi, and Narrabri upstream, for taking — and being allowed to take — too much irrigation water to fill huge ­private dams all year from the finely balanced system. As a result, Wilcannia locals, who must boil their tap water before it is safe to use, are angry at the death of their lifeblood inland river. These were issues that we would be addressing, as part of the DPM project. After a long but beautiful drive, and picking up our fifth team member, Michael Graham (aka MC Boomalli) in Collarenebri on the way, we arrived at our accommodation on the outskirts of town. That was when I met Uncle Terry Doolan for the first time. He had been invited there to help us with the project. A softly spoken, friendly Wiradjuri man in his late fifties, with a twinkle in his eye. He grew up in Bourke and travelled around a lot, living in Perth, Broken Hill, Menindee, Dubbo and Wilcannia. We spent time getting to know each other throughout our time in Wilcannia, and by the end of a week I had grown very fond of him. He was clearly struggling physically, having trouble with his breathing and standing up straight. He told us he had emphysema, but brushed it off as if it was nothing. We spent the first evening having a barbeque with the staff members at Warra Warra Legal Service in Broken Hill, who had funded the project. Uncle Terry introduced us to his daughter Lucy, who works at Warra Warra and was also there to help out with the project. Bilyirra Bates, Broken Hill local and Warra Warra staff member, and a couple of his friends had been out hunting that day and brought some freshly caught kangaroo to be cooked. The already filleted meat was cut into bite size pieces that were covered in a mix of flour and allspice. It was so tender and delicious and the barbeque was a great way to connect with everyone involved. The next morning Uncle Terry came with us to meet the kids at Wilcannia Central School. We introduced ourselves and Toby showed the group of 15 kids, aged between 12 and 16, a few of the previous songs and music videos that DPM have done in other communities over the years. It was encouraging to see their faces light up when they saw the videos. I could see the excitement in their eyes for their ‘brothers’ and ‘sisters’ who had summoned the confidence to perform in front of the camera, about issues that they could closely relate to. From there the ice was broken and the process of facilitating a conversation could start. It was an incredible sight to behold when the kids came out of their shells and contributed to writing words on the white board about how they felt about their community - the good, the bad and the ugly. DPM’s process is about ‘the real’, ‘the ideal’ and ‘the bridge’. The kids are encouraged to talk about what Wilcannia is really like to live in and all the issues that they face. Then they are asked to imagine what Wilcannia would be like in a perfect world, what would be different, how would it look and feel. Finally, the conversation turns to ‘the bridge’, which is how we get from ‘the real’ to ‘the ideal’. By this point the kids were animated and keen to add their thoughts. By the end of this process, the white board, which was split into three sections, was jam-packed with words that the kids had come up with. The next step was a short lesson in Hip Hop - its history, its different aspects and its impact on the world. Using the words that they’d chosen, they create ten verses and a chorus. This is an organic, energetic and collaborative method where the DPM team and the kids bounced ideas between each other until they were happy with how the poetry sounded. There was excitement in the air because two of the Wilcannia rugby league teams had reached the grand final and were playing each other in Broken Hill that weekend. The lyrics in the song reflect how proud the kids are of their teams. Half way through day two, the song was finished and it was time to set up the ‘recording studio’. This took place in the office of WINGS – Wilcannia’s drop-in centre. The kids were asked to put on the headphones and step up to the microphone individually to relay certain parts of the verses and chorus. Any shyness or shame soon dissolved and it was plain to see that they were really enjoying themselves. By the end of day 3, the entire recording was finished and it was a matter of splicing the different parts together with the beat, to create a song that we could play back to the kids the very next day. It was a satisfying experience to see the look on the kids’ faces when they heard the song for the first time. One of the boys had already memorized all the words and was singing along with it. He ended up being one of the main rappers. In the weeks leading up to the project, inspired by Jared, there was an idea that I thought would work really well with the Wilcannia mob. Instead of using traditional ochre, or white pigment to paint the kids up before they danced, we could use ultra-violet paint and do the filming at dusk with a black light. In my mind it looked amazing, and I hadn’t seen anything like it done before. So, when it was time to shoot the video, the idea was unleashed. 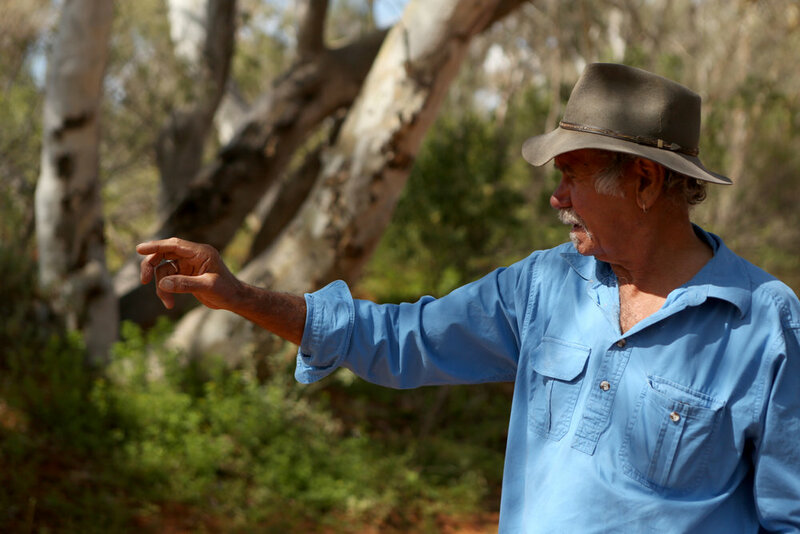 Walpra Thompson, local community consultant and language specialist, and Bilyirra Bates, went out to the old dancing ground at the edge of the bushland and cleared the space. They built 3 fires at the edge of the dancing ground. We rounded up all the kids and Uncle Terry and once we’d all arrived at the dancing ground, we cracked open the UV paint. The older fellas were painting the younger fellas. We were painting the kids. The girls were a little more reserved about their paint so they did their own. Everyone looked great by the time we were ready to start shooting. The sun was setting and the fires were lit. Toby and I were poised with our cameras as Jared turned on the black light, which was being powered from an inverter in his van. The effect was astounding! The paint was glowing so bright! The kids were encouraged to ‘shake a leg’ and kick up the dust whilst doing dance moves that resembled the actions of different animals that live in the area. The goanna and the kangaroo were the most popular amongst the youngsters. The energy built and built and the boys became more and more confident, moving towards the camera and raising the bar as to who could bust out the best moves. Everyone watching was swept up in the scene. It was such a great feeling to see an idea come to fruition in such a fantastic way. And to top it all off, it was Uncle Terry’s birthday. After packing everything away, we headed to the golf club in town to celebrate, where we were assured that the Chinese food there was delicious and well worth a try. To make the whole experience even better…it was pub quiz night. Our team was called The Doolan Seven, and after what we thought was a strong fight for first place, we were informed that we didn’t even hit the top three. Our spirits remained high as we enjoyed a few drinks together. There had been quite a lot of rain in Wilcannia in the weeks leading up to us arriving. So the Darling River had water in it, which, as the locals told us, was a very rare sight to see. The dirt roads spreading out to the more remote parts of the community where boggy and puddles pooled at the side of the main streets. 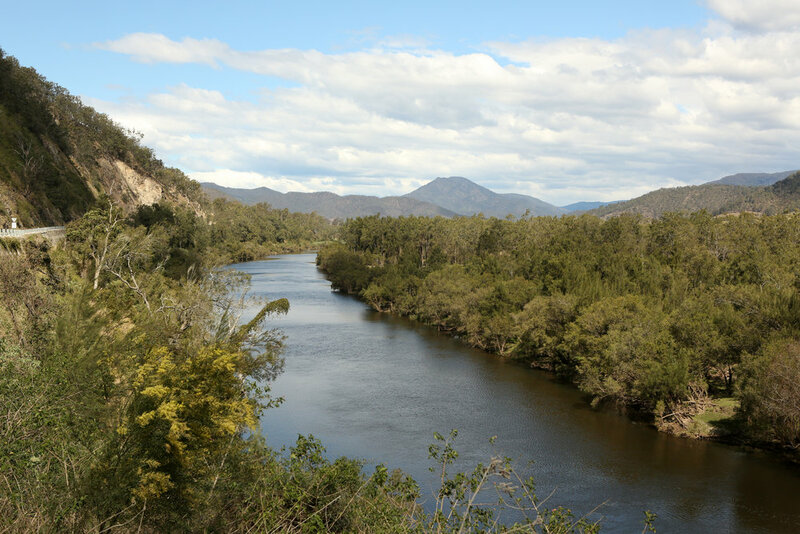 The Darling River, September 2016. Uncle Terry had told us about an elder called Uncle Woddy, who lived on the outskirts of town. We decided on the fourth day, to go together and visit him at his home. Driving up to his house, there were an array of different abandoned cars and trucks. It looked like a car graveyard. In amongst all these rusted shells was a corrugated tin shack with a little fire burning out the front. This was where Uncle Woddy lived alone. He’s a friendly, welcoming man who wore a flannel shirt and an akubra hat. He invited us all into his humble abode and we stood while he told us stories of his community, old and new. He told us about the tragic suicide of his son and some of the rifts between different family groups in Wilcannia. He then told us about his artwork and brought out a collection of wooden bowls of all different shapes and sizes. The Paakantji River Red Gum trees tend to grow these budges on the outside of the their trunks, which Uncle Woddy described at ‘cancers’. He would go and cut these ‘cancers’ from the surface of the trunks and take them home to turn into bowls. He would burn a curve on the inside and chisel it away until it looked like a beautiful, organic wooden bowl with all the imperfections still visible. We were all mesmerized, and as soon as he told us they were for sale, we all jumped at the chance of owning one. He’s an animated and engaging person to converse with. He looks deep into your eyes when he talks to you and at first it was a little unnerving, but after a while it was actually very comforting. I felt a connection to him, a deep reverence. The rains came again that night and what was to be our last day of shooting, had to be cancelled until the following Monday. So, we headed to Broken Hill to get prepared for what was going to be the biggest rugby league game in Wilcannia’s history. Both the Wilcannia teams, The Boomerangs and The Parntu Warriors, were to battle each other in the grand final of the Outback Rugby League. Now, much to Toby’s surprise, I’d never been to a live rugby league game before, so I was excited that this was going to be the first one. We headed to the Memorial Oval and even driving in the gate, we could feel the buzz in the air. People had made big signs supporting their team, the crowd were growing by the minute and the atmosphere was electric. We got our camera gear out and went down to the sidelines to wait for kick-off. We could see the cup being displayed on a table in front of the pitch and thought it would be an epic shot to get the captain of each team to hold each handle of the cup in the air. We got some footage of the teams running out and some tackles during the game, but mostly I was in awe of the whole scene. The Parntu Warriors vs. The Boomerangs in The Outback Rugby League Grand Final. After a suspenseful game, The Parntu Warriors won with a score of 28 – 14. Uncle Terry and his daughter Lucy were there and we caught up with them after the game and watched the crowd filter out. We spent that evening cooking dinner with Uncle Terry and Bilyirra back at our accommodation. It was good to connect with them both outside of Wilcannia and the DPM project. To find out about their lives outside of work and learn more about what makes them tick. It somehow brought us closer. Uncle Terry passed away a few months after the project. I feel honoured to have known him for the short time I did. Toby and I caught up with him over Christmas in Perth, and his passing has been very difficult for all of us. He was a really amazing man, and a friend and a mentor for Desert Pea. He was one of the first Aboriginal people I felt connected to, and my heart goes out to his family. I feel like we are all better for having known him. The next day we met up with a well-known artist called Badger Bates (William Brian Bates), who is Bilyirra’s father. He wanted to take us out the Darling Riverbed and tell us some stories about the area. It was an honour to be invited on such an adventure, so we jumped in the car and met Uncle Badger on the outskirts of town. We followed him in convoy for about twenty minutes until he stopped his car on the side of the road and got out. We walked along the dried out riverbed and Uncle Badger pointed out different varieties of bush tucker. There were these little red berries that tasted like tomatoes and this thin grass that looked a bit like chives, but tasted like lemon. Uncle Badger called it Bush Lemongrass. He showed us the tracks that a kangaroo had made through the soft red dirt of the riverbed, whist we made our own tracks alongside them. Uncle Badger invited us back to his house in Broken Hill so we followed him back into town. We were welcomed into his beautiful front yard by his wife, Sarah. Their garden was bursting with different plants. Uncle Badger showed us around their lovely house where the walls were filled with his artwork, his friend’s artwork and photos of his family (including a very cute childhood photo of Bilyirra). Uncle Badger works in linoprint, wood, emu egg, stone carving, and metalwork, reflecting the motifs, landforms, animals, plants and stories of Paakantji land. His artwork references places of ceremonial and mythological importance, depictions of traditional life such as hunting and gathering bush tucker, and stories about the ancestral spirits, as well as contemporary issues such as the degradation of his beloved Darling River. His pro-active, peaceful attitude is one of his defining characteristics and was articulated in his public work The Reconciliation Stone, carved from a stone chosen from the local Baradale property, for the people of Wilcannia in 2006. The simple graphic images incorporate the Ngatyi (the Rainbow Serpent) as the creative and symbolic device to hold together an informal arrangement of the different symbols of ethnic groups who participated in the rich history of the region – a Scots Thistle, an Irish Shamrock, an Afghan camel and a Chinese water-carrier, alongside hand-prints and an old black fella’s face… looking up into the sky. Uncle Badger's artwork is breathtaking and it warmed my heart to be given an insight into the stories behind each piece. I felt humbled to be invited into his home with such warmth and generosity. In the backyard was an old campervan, which Jared had a good look at. On our way out, he gave us some cuts of kangaroo, to take home for our dinner. Both Uncle Badger and Sarah were interested in checking out Jared and Ashleigh’s van and there was an exchange of ideas when it came to fit outs. It was a bit of a wrench the say goodbye but we all drove off into the sunset with full hearts. Back in Wilcannia, we had a full day of shooting to get underway. The kids were pumped and the feeling was mutual. We went to all the landmarks in town, including the Wilcannia sign as you’re driving in, the bridge over the river and out to the mission, at the edge of town. We also made a trip to the ‘The Mallee’, which is one of the residential areas in Wilcannia. Lastly we headed down to the river’s edge, a bit further out of town, this was the site of the infamous ‘witches’ tree. There was a certain mystery shrouding this old tree, as if no one wanted to even speak its name. We were told we could look but don’t touch. Just before sunset, the filming was complete and we congratulated everyone involved for their hard work, enthusiasm and determination. We were all stoked with the song and the footage that we had to work with. So, after our goodbyes, we headed back to our accommodation for a goodnight’s sleep before the fifteen-hour journey home. It was an epic adventure, with each day filled with adventure, meeting new faces, connecting with elders, hearing amazing stories and sharing a creative process that would last forever. Toby Finlayson, myself, Jared Melrose and Ashleigh Butler. Proudly presenting the finished music video from The Wilcannia Mob: Intergeneration – 'OurCountry, Our Way'. The first time I saw one of Anatar's Canopy Cradles was at a music, arts, lifestyle and environmental festival in South-East Queensland. It was suspended from a large tree next to one of the dance-floors and there were at least four young kids swinging in it and laughing their heads off. It put an instant smile on my face to see them having so much fun, and also awoke this part of me that instantly wanted to be swinging in that big basket too. It was a few months later when I was given the opportunity to meet the woman who had made these wonderful Canopy Cradles and photograph her with her own creations, it was one of the most magical photographic experiences I've had to date. Residing in a wooden hut next to a creek not far from Mullumbimby, NSW, Anatar lives at one with nature. It was an enchanting experience to visit her at her open-air home and see how she's made it possible to live a full and beautiful life without leaving a large footprint. "It is a lifelong learning and yearning that have led to these baskets being born, from years living lightly on the earth and spending long periods of solitude, submersed in nature. They demand massive amounts of motivation, intuition, awareness, skill, sensitivity, flexibility, resourcefulness, dedication and a deep connection to the self and the spirit of the land. One would need to follow me around for the whole process to fully appreciate what a labour of love they are." In the past, Anatar was the quiet achiever, shying away from being 'seen' or feeling too humble to shine. However, Anatar wants to leave those old, limiting beliefs behind. She believes the world needs people with insight, compassion and sensitivity, to step up and become facilitators of change. In the photo shoot the wings were used as a metaphor for Anatar stepping into her own power, soaring to the next level, reaching and sharing her full potential. The wedge-tail eagle has an extremely powerful spirit and the wings were gifted to her, by someone who sees her strength and intention. She saw the gift as a sign that it's time for her to spread her wings and take her life's purpose to the next level. "Canopy Cradles are a culmination of all I have lived and learnt thus far. They are ethically and sustainably harvested with total respect and connection to the land, hand-made from all natural materials and transported using a vegetable oil fueled vehicle." She spends half the year at her creek-side home and the other half in Far North Queensland where she forages in the jungle to harvest what is needed to make the Canopy Cradles. She sources all her own materials by hand. These photographs are a portrayal of Anatar embodying the wild, tribal essence that permeates her entire life experience. She often jokes that she feels like an indigenous soul, born into a white body, in some time and space that feels quite alien to her, almost like an abstract sci-fi movie. She finds it difficult to understand how people are living completely disconnected from the land, which has always been our life-blood. "How can we remove ourselves entirely from something that is inseparable from us?" The idea to cover herself in mud was about stepping into her native skin, to eliminate the boundaries and illusions that keep us disconnected from the natural world. She has often yearned to dissolve the sense that she is separate from all that surrounds her and she sees the skin as one of the the illusions that maintains that sense of separation. By covering herself in clay she felt as though she was merging with all that is. It's also an expression of her wild side that is fed and nourished by the entire basket-making process. When she's harvesting the vines from deep in the jungle, it stimulates her hunting instincts and triggers a heightened sense of alertness and connection to the intricate, intimate agreement that is nature. "I delve deep into the forests hunting the longest, juiciest tendrils of this ancient vine. I always ask the land for it's blessing to be there, and I harvest only where it is a pest to its surroundings. The job of these vines is to entangle themselves throughout the jungle and up into the canopy to reach for light, and my job is to wrestle them out by hand, often climbing into the canopy to cut from the top." "I am blessed to bring these Canopy Cradles to life and witness the impact they have on people, and the sense of magic and wander that the natural world offers." It was a great experience to collaborate with Anatar on this project. We both came away very excited about the images. It was an absolute pleasure to be able to bring Anatar's vision into a reality. It was also inspiring to meet this unique creature and witness such a raw and alternative way of living, loving and creating that is so at one with the our fascinating planet. For more information about Anatar and her Canopy Cradles check her out online.